Sabrina Antoine '11 is dedicated to ensuring that underserved young adults gain the skills, experience and opportunities to thrive. Boston native Sabrina Antoine ’11 had never even of heard of economics before she came to Smith. With limited resources at their disposal, her high school teachers focused on the basics, and when it came time to consider college, Antoine assumed she would major in English because that’s what she was good at. But Smith’s open curriculum changed everything. “I had the opportunity to explore different courses, so I tried my first economics course,” she says. “I was so tuned in—I loved what I was learning, and I needed to learn more.” Since then, Antoine has been passionate about social economics and economic equality. Today, Antoine works at Year Up Boston, which connects top corporations in need of mid- and entry-level talent with high-potential urban young adults from Boston’s most disadvantaged communities. 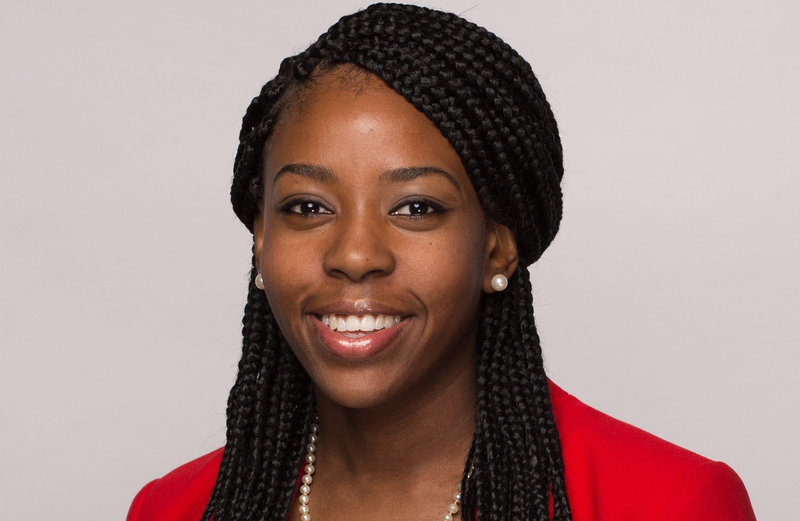 Antoine’s passion for a career related to economic justice was solidified after she spent a semester studying abroad in South Africa and learning about the effects of apartheid. But when she returned to campus, she felt she finally needed to put on her “practical hat” in terms of looking for a well-paying job. She was recruited by Lincoln Financial Group before her graduation, and she subsequently moved to North Carolina to work in project management and then financial analysis. After about four years with the company, she realized her heart was more aligned with the volunteer work she did with inner-city youths through organizations like the YMCA. “I decided to make a leap, and follow my heart to where my energy really derived, which was helping to eliminate economic disparity in this world,” she says. She came across a book called A Year Up: Helping Young Adults Move from Poverty to Professional Careers in a Single Year by Gerald Chertavian, founder and CEO of Year Up, a nonprofit that provides year-long intensive training programs for urban young adults. She was so impressed with his ideas that she sent Chertavian a message via LinkedIn, just to let him know how much she liked the book. He wrote back encouraging her to visit the Year Up offices in Boston. Antoine took Chertavian up on his offer and met with a number of people in the organization. “It was definitely my calling. I put my notice in for my high-paying job in finance to move back to Boston to do temp work at Year Up!” she says. Antoine is currently associate director of partner relations at Year Up. She matches corporations with career seekers and facilitates daily interactions among the agency, interns, and corporate partners, developing account expansion opportunities and serving as a mentor, group facilitator, and advocate—among other responsibilities. Sabrina Antoine ’11 and Nafeza Kingston ’11 will lead a workshop titled In Sync with My Success at the 2018 Women of Color Conference in April. The workshop will enable women of color to define success in every aspect of their lives on their terms, set goals, and learn life hacks to achieve those goals.